Relaxation for me involves horseback riding in the great outdoors, or just simply fishing the day away. What a way to start the month of May! 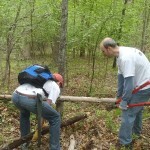 Eight volunteers from Prince William Trails and Streams Coalition joined together at Silver Lake Regional Park on the first day of May to perform much needed trail maintenance. Trails the organization had opened over a year ago had been hit hard by the winter and recent spring storms leaving 15 trees that had been blown down onto the trail, or were left leaning over the trails forcing users to turn back or go around. Prince William Trails and Streams Coalition volunteers worked to remove all fifteen trees, as well as trim back many of the limbs that were beginning to close in on the trails. Additionally, the PWTSC used the DR Mower to walk the sections of overgrown trail inaccessible to tractors and bush hogs, but that had grown vegetation making it tough to enjoy hiking the trails with taller grasses and invasive thorn bushes. We’d like to thank the PWCPA for continuing to support public passive recreation, and the many volunteers who combined efforts to make this happen. 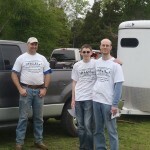 In all, over 26 man-hours were volunteered. 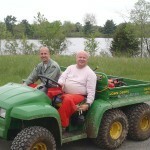 With the completion of this work, several miles of trails are again passable and able to be enjoyed by all. If you would like to participate in future events, please check the calendar on the website www.pwtsc.org, or sign up to receive the monthly newsletter announcing upcoming events. It truly was a great work-day. James Long Park workday in March – Success! On what turned out to be a chilled morning in March, Four Potomac Appalachian Trail Club volunteers and Mike Depue of the Prince William County Park Authority joined fourteen Prince William Trails and Streams Coalition volunteers to blaze a new trail connector and install ten trail markers. This new section of trail completes the system that was started two years ago at James S. Long Regional Park. This section paralleling Old Lightner Rd required bench cutting, leveling, clearing of downed trees, and a fair weather crossing, connecting the picnic pavilion area to already existing trails on the northwest side of the creek, all in a beautiful woodlands setting. To top it all off, a citizen and his dog were observed using the new section of trail within minutes of its completion. We’d like to thank PATC for the sawyers, the PWCPA for continuing to support public passive recreation, and the many volunteers who combined efforts to make this happen. 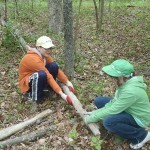 In all, over 18 man-hours were volunteered. With the completion of this last section of trails, the PWCPA will soon be able to install a kiosk with map showing the four loops totaling around 4.5 miles of trail open to the public for use.